Laurent Brondel was born in France, where he first fell in love with guitars. Today he lives and works in Maine. Brondel guitars are handmade with a combination of traditional craftsmanship and modern luthiery techniques. One Man’s Guitar asked Laurent to share some insight regarding his mind and methods when it comes to making guitars. One Man’s Guitar: I have had the pleasure of playing three of your guitars, an A-2 cocobolo/Adriondack OM and an all-koa version of “The Essential” A-3 14-fret 00, both from 2010, and a B-2 12-fret 000 made from Cuban mahogany and Engelmann spruce completed in 2011. While there is a family resemblance there are notable differences between them than just tonewood species and body size. The B-2 was built with arched plates. The top is straight longitudinally but is arched laterally on a 5’ spline curve. 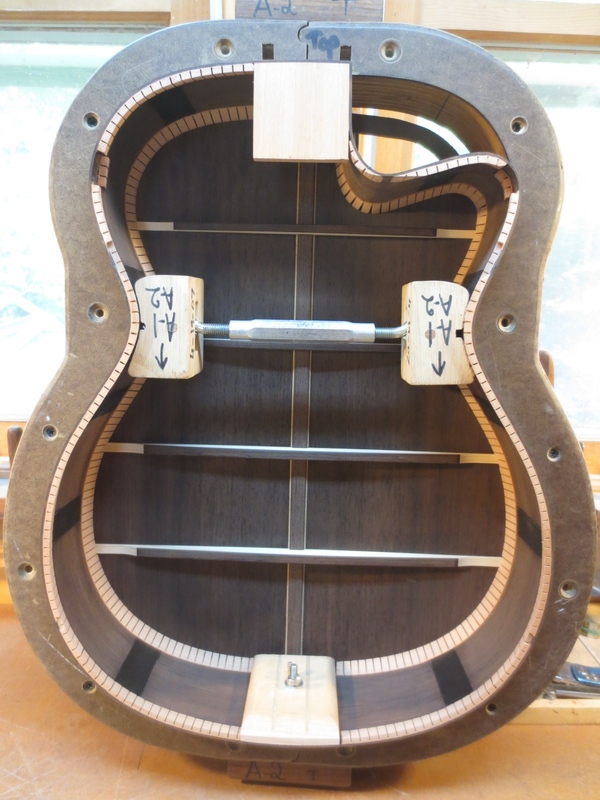 So is the back, in addition of having a very slight longitudinal arch for stability purposes (the top does not need it as string tension naturally tends to pull the top upward). You can clearly see that if you look at the soundbox from the end wedge. One Man’s Guitar: When did you start using the arch design? Brondel: I started building with laterally arched plates in 2008/9, and exclusively used that method from 2010 on. I was encouraged to try this first by observing Stefan Sobell’s magnificent guitars, and then directly by Rick Turner in conversation when I was experimenting with an adjustable neck and wanted maximum strength without sacrificing tone and dynamic range. The lateral arch is achieved with the help of a form, with a 5’ negative arch. The bottom of braces are shaped to this 5’ arch, including the x-braces. Braces are glued in a go-bar deck, same as with a radiused dish. One Man’s Guitar: Is this so you can use thinner soundboards? Brondel: The lateral arch gives me more longitudinal strength, so theoretically the plates could be thinner. However, my evolution has led me to slightly increase the thickness of the plates and correspondingly reduce the bracing. It is all related. The sum of the parts must withstand string tensions sustainably, and yet amplify the strings to the maximum potential, in the most musical way. One Man’s Guitar: An inspection mirror showed the bracing differs considerably on the three guitars, which I assume is related to the difference in arch vs. radiused plates. Has your bracing philosophy and technique changed over the years? Brondel: It all comes from pre-war Martin bracing, really, and is a variation/evolution of it. I think most of my guitars before 2011 had tapered x-braces, scalloped tone bar(s) and 4 finger braces. Very similar to late ‘30s Martin typical bracing, with the exception of a massive transverse bar in the upper bout and sound hole braces. Progressively, starting in 2009, I scalloped the x-braces more, and left my tops thicker. So less wood in the supporting braces, and more wood in the top, so to speak. I liked what I was getting, and now my x-braces are very scalloped, and my tops probably 5% thicker on average than pre-2009/10 guitars. I also started replacing the 4 finger braces with a pair of “finger patches”. One Man’s Guitar: Does this evolution extend to bridge plates? Brondel: I experimented with bridge plates a lot. Material, size and even laminations. The A-2 you reviewed has a laminated bridge plate made out of maple running lengthwise with the top, and cocobolo, running cross-grain. I progressively abandoned the lamination idea and progressively reduced the size of the bridge plate. It is a whole really, and is in conjunction of the different geometry I began using on the soundbox explained below. Material is now usually Brazilian rosewood (or a close equivalent like Madagascar or Panama RW), or maple when I want to get closer to a neutral / vintage tone, or want the absolute lightest material on a small soundbox. One Man’s Guitar: Likewise, you cap your back braces with some sort of rosewood. Is that for extra stability? One Man’s Guitar: The all koa A-3 Essential does not have caps on the back braces. Brondel: Those are tapered in height to a knife’s edge almost, not unlike some turn of the century Martins. 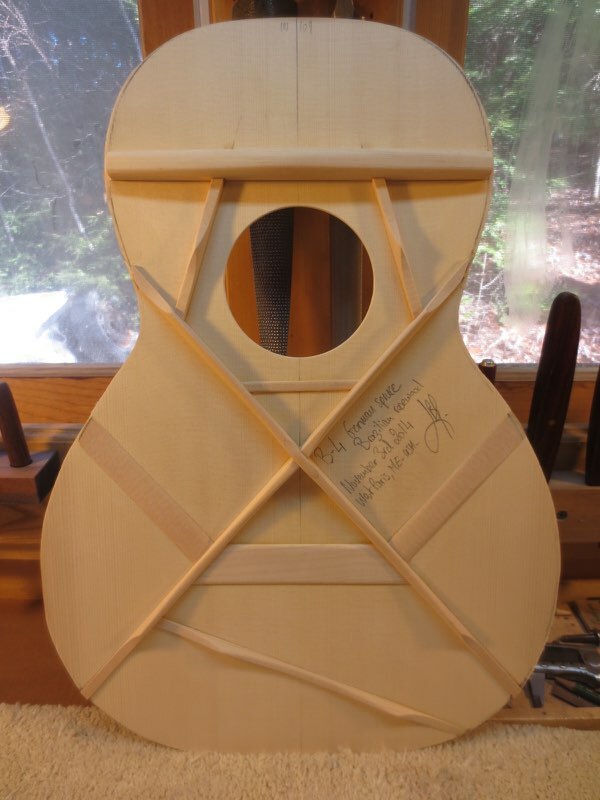 One Man’s Guitar: I also noticed two tone bars, just inside the sound hole, on either side of the strings, carved to a point, like the peaks on a longer example of scalloped bracing. They were shaped differently on all three guitars. Where the spruce-topped B2 and A2 examples had whittled points typical of scalloped bracing, the ones on the koa-topped “Essential” model were flat across the center. 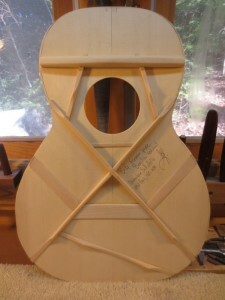 Brondel: Those sound hole braces were usually scalloped with the peak roughly at the center of the sound hole. They’re a variation of what can be found on some vintage Gibsons. They’re also mortised in the UTB I mentioned earlier, and as a whole make a very strong upper bout in conjunction with the inverted Spanish foot on the neck block. Of note, on those guitars the top is also probably doubled around the sound hole, between the UTB, sound hole braces and x-braces. I stopped doing this in favor of a small cross-brace above the X brace in 2012. 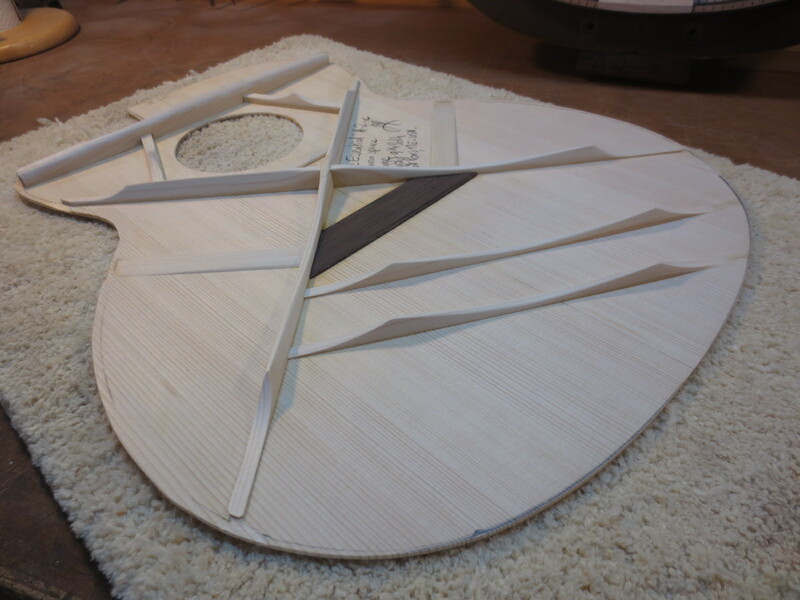 Below are photos showing the interiors of some recent Brondel guitars.